Only trade deadline day can make the Intertubes blow up at 4:30 p.m. in the afternoon. Well, unless Heath Ledger dies. Anyway, Jon Heyman's got it: Manny Ramirez has been traded to the Dodgers. His manager is Joe Torre. Muse on that. The details are still filtering in — that is to say, Heyman is typing them up really fast — but it appears Jason Bay is going to the Red Sox and the Pirates have a bunch of people only Joe Sheehan has heard of. MLB.com has a conflicting report, but one suspects they'll take that down soon and pretend it didn't happen. 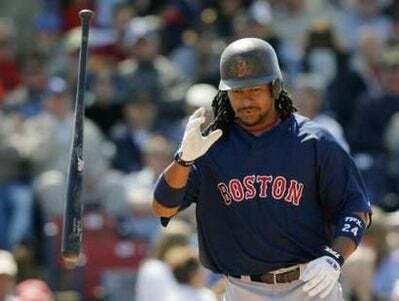 But yes: The Boston Red Sox have traded Manny Ramirez. It's like learning that Santa Claus lost 300 pounds. Sure, it's probably best for his short-term and long-term health ... but man, it just won't feel like Santa, will it? I'll let Daulerio and the gang analyze it all, but ... right now, they needed someone who types really fast. The announcement will be made in conjunction with a World Baseball Classic announcement at Dodger Stadium shortly.